From the outside looking in,Karen and Richard Sharpe appeared to be a happy,successful couple.They had been high school sweethearts and had married after the birth of their first child,Shannan.Both had resisted efforts from their parents to put the child up for adoption.After a hard couple of years where Karen worked and supported Richard while he studied for his medical degree,Richard finally qualified.Richard turned out to have a brilliant business mind and built up quite a fortune over the years. The fortune amassed was very much under Richard's control until he transferred half of it into Karen's account as he was trying to avoid paying tax.Shortly after,coincidentally,Karen filed for divorce.Richard then started stalking Karen which eventually forced Karen to get a restraining order against him as she now feared for her safety.Richard Sharpe calmly walked up to the house she was living in and shot her point blank in front of several witnesses. As there was no doubt as to who the murderer was due to the number of witnesses to the murder,Richard Sharpe's defence decided to enter into a plea of insanity.The details revealed were an extremely violent childhood at the hands of his father.The one daughter of the family escaped most of this violence and due to that,Richard as a child started dressing up as a girl.This abuse as a child resulted in an adult man who cross dressed regularly,who even stole his own daughter's underwear,who stole his wife's birth control tablets in order to grow breasts of his own,and who was an extreme tyrant with his own family.The years of abuse suffered by Karen and her children were revealed in detail with testimony by Shannan the grown daughter.There was 18 years difference between the first child Shannon and the younger two children. The book then goes through the legal battle that the oldest daughter and her aunt and uncle went through to secure legal custody of the younger two children.The malingering on the stand by Richard Sharpe so he could prove he was insane was ridiculous and transparent. (I saw the tv program as well).Details from past employees who gave testimony as to their own abuse by Richard Sharpe in the workplace. Considering all the above anyone could reasonably reach the conclusion that this man was indeed mad.Over and above his actions,years of platic surgery performed on his face also resulted in an extremely strange and scary face which I am sure helped his cause towards proving insanity. Testimony by psychiatrists and others in the medical field stated that Richard Sharpe only acted strange when he thought he was being observed.They even had video footage of an interview with a psychiatrist,where the psychiatrist leaves the room,and Richard Sharpe who until then had been showing great strain,quickly gets up to look through the doctor's notes. 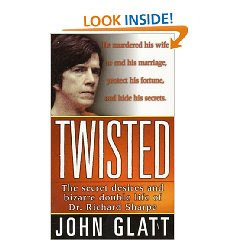 Based on all this testimony and personal accounts from witnesses, Richard Sharpe is convicted and sent off to jail.This book Twisted by John Glatt provides all this relevant information in an easy to read and follow format(as he usually does).I would recommend reading this book as it even had more information than the hour long program I watched on this true crime case. I read this book via Kindle in June 2009. Although Richard Sharpe had murdered his wife,Karen,and there was no doubt about that with the many witnesses to that fact,he still had control over when Karen's body could be released to the family for burial.He was the only who could sign the papers and true to form,used this as a power play to keep her family hanging on for longer than necessary before signing.I understand that he had not yet been convicted and therefore all his original rights remained in place,should there not be a law that says if it is a "slam dunk" case like this,that his rights should fall away.This also pertains to the fact that relatives had to fight for legal custody of the two young children costing money and court time that could have been spent on other cases.So my question,if an alleged murderer pleads "not guilty by reason of insanity" then coupled with that plea should be a signing off of all rights,my point being if you are insane you cannot make any important decisions and the court should appoint someone immediately (not his choice)to take care of his affairs and sign off on all actions? I agree 100%. Insane people cannot make important decisions...especially those that involve children. I don't think that they should have any rights whatsoever, especially those that involve their deceased spouse. The court could certainly appoint someone of sound mind to make decisions. Again with the law driving people nuts. For the sake of the kids you'd think the court would have just handed them over without any problem. aarrrrgg. I would think that would be a natural thing - you pled insanity - how can you handle anything much less these life changing and life affecting decision..
Agree with Missy 100% should not be allowed any of those privileges. Missy/Sharon,the more I see these stupid laws and the more you guys agree with me I wonder then who is deciding on these laws.It seems us ordinary people all agree and we do have our votes come voting time then how come the laws are still so stupid? E.H. Richard Sharpe was sentenced to life in prison but committed suicide in jail in Jan 2009.He had tried to commit suicide in 2002.But before we feel sorry for him we need to remeber mad or not,he needed to be taken out of society and an insanity plea could have had him out in a short time.This guy even tried to arrange to have the prosecutor killed.